Thank you for your interest in a docent led tour of Point Cabrillo Light Station State Historic Park. You need at least 10 individuals in a group to book a tour. If your group is smaller in size, please visit and enjoy our exhibits that provide abundant information for visitors. There is a retail volunteer in the Lighthouse from 11am to 4pm daily who can answer questions when they aren’t helping other visitors. What does it cost? $5 per person (including children). If you are interested in a docent led tour, you must book this at least three weeks in advance by e-mailing tours@pointcabrillo.org. 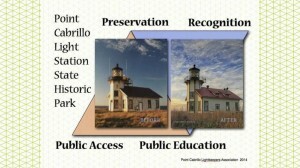 A docent led tour donation helps to support the education, restoration and maintenance activities of the Point Cabrillo Lightkeepers Association. We are a docent led, docent run non-profit organization. Generous donations allow us to host 1000 regional school children each year in an award winning outdoor education program taught by professional educators, buy roof paint, pay the electric bill for the light, restore buildings and do all the other necessary things. We are grateful for your generosity. What will the tour consist of? Docent led tours are somewhat flexible in scope depending on your group’s interests. Your group will meet the docent(s) in the parking lot near the Visitor Center and walk down the hill to the 1st Assistant Lightkeeper’s House, Marine Science Exhibit in the Blacksmith & Carpenter Shop and the Lighthouse. If time, weather and your group’s interest allow, the docent(s) can take hikers to the Frolic Cove overlook in the State Historic Park. Please be aware that there is a 1/2 mile walk from the parking lot to the Lighthouse. Vehicles displaying appropriate disabled access placards with the disabled individual in the vehicle are permitted to drive to one of the two disabled parking lots “down the hill”. One is located behind the 1st Assistant Lightkeeper’s House and the other disabled lot is in front of the three keepers’ houses. Disabled folks can then rejoin the pedestrian portion of the group for tours of the 1st Assistant Lightkeeper’s House, Marine Science Exhibit and Lighthouse. Please dress for coastal conditions which may be windy, cold, foggy or rainy at any time, even when it is hot inland. Dress in layers and wear good walking shoes. It is usually colder at the Lighthouse than it is in the parking lot! The 1st Assistant Lightkeeper’s House is the eastern most house. It has been historically restored to its 1909 appearance. The entrance is at the back. The bottom floor is a museum that depicts what it would have looked like when lived in by the Lightkeeper’s family in the mid 1930’s. There are bathrooms in the small utility building behind this house. The Blacksmith & Carpenter Shop houses our Marine Science Exhibit. The exterior has been restored to its 1909 appearance, the interior restoration is pending. Please enter and enjoy our beautiful 240 gallon salt water aquarium and educational displays. All displays and photos were created by talented volunteers. The Lighthouse is the crown jewel of the property. It and the lens appear as they did in 1909. The restored 3rd order Fresnel lens is in operation. As a result, it is not accessible to the public with the exception of Lens Tour events. Those dates are posted here. Your docent can answer questions about this building and the lens or your group can explore the exhibits that illuminate the fascinating history of Point Cabrillo. The Lighthouse also houses the giftshop. The retail docent can also answer questions for your group. All proceeds from the giftshop go to maintain the Station. The middle house is the Head Lightkeeper’s House and is a vacation rental. The proceeds from this rental all go to maintain the buildings and site. The Head Lightkeeper’s House has been adaptively restored to historic standards and the exterior appears as it did in 1909. Brochures are available on the outside of the gate but we ask that you respect the signs that say “Guests Only” beyond the gate. The west most house is the 2nd Assistant Lightkeeper’s House. It is also a vacation rental with all profit going to maintenance of the site. Please respect the signs that say “Guests Only” beyond the gate. Behind the Head Lightkeeper’s and the 2nd Assistant Lightkeeper’s Houses are two small buildings that were utility buildings for the Lightkeepers. They are currently also vacation rentals and so not open to the public. To learn more about our vacation rentals, click here. The Oil House is a small concrete building. It is restored to its 1909 appearance. It houses communication equipment and has a few “non-historic” antennas on top that communicate with passing ships and are part of the Federal Aids to Navigation. You may also see the abundant wild animals, birds and plants that inhabit our beautiful 300 acre site. Please respect that you are visiting their homes.